Environmental consulting is a diverse area and the objective on specific jobs vary, but it will generally entail the employment of better company practices to help a customer financially, through improved environmental practices, or to ensure compliance with environmental rules. 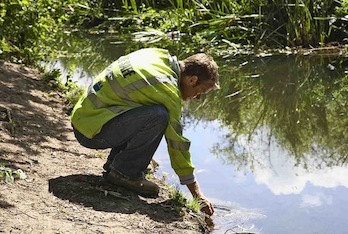 Environmental consultants are hired by businesses and governments to check and manage air, soil and water quality, do environmental audits, check the environmental impacts of building, mining and so on, monitor compliance with environmental standards, draft environmental policies or take measures to mitigate or rectify damage to the environment. Contractors, property developers or companies may require the support of environmental consultants to show that their company, building site or development is in com pliance with appropriate environmental regulations or laws, and in these circumstances environmental or ecological consultants will supply documentation of the appropriate technical tests, for instance soil, water and air testing results or ecological survey results needed by law. These reports will typically be presented to an approved auditor or government department to make sure that approvals can be obtained or adjustments to the plan can be made in order to gain the necessary approvals to get the go-ahead on your project. When you are choosing your environmental consultant it’s a good idea to look for previous clients and projects to see if their reviews or track record indicate their services are of high quality. Also look for experience, businesses that have been around for a while are generally well versed in the relevant environmental laws and have good procedures in place, this is generally helpful to get what you need more promptly. Understanding which type of environmental expertise your situation requires will help you begin your search for the right consultant for you. Environmental consultants are typically trained in a specific area and then apply this training to a certain sector. Due to this, environmental careers tend to be in certain disciplines wherein the consultants themselves are trained, as an example contaminated land consulting, environmental engineering, ecological consulting, farming, mining or air quality management. And lastly, look for signs that they are passionate about what they do and take pride in being of great service especially if that translates to fast response and turnaround because that can be a critical factor in delivering your overall project on time and on budget.